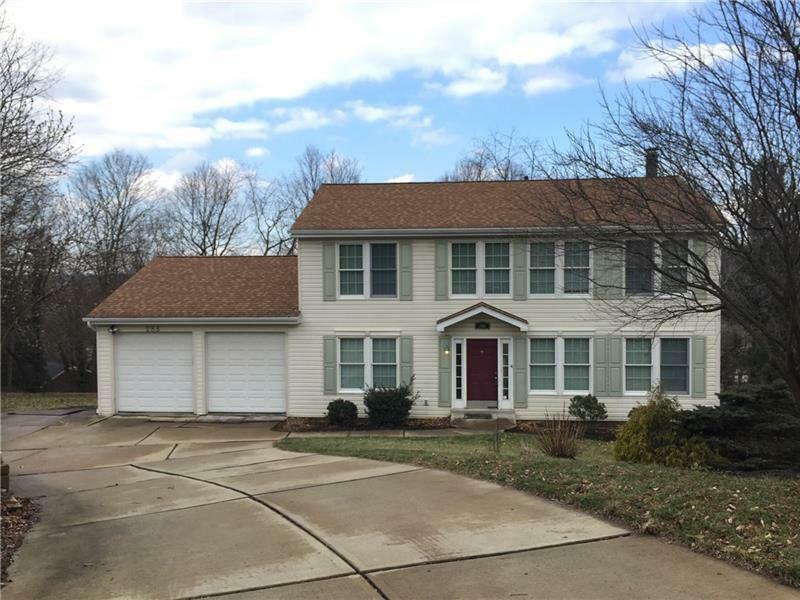 SPACIOUS TWO STORY COLONIAL ON DESIRABLE CUL-DE-SAC STREET IN UPPER ST CLAIR! GOOD CURB APPEAL, INVITING ENTRY TO GREET YOUR GUESTS, FORMAL LIVING ROOM & DINING ROOM. FULLY EQUIPPED EAT-IN-KITCHEN WITH UPDATED APPLIANCES, CENTER ISLAND, & WORK STATION AREA OPENS TO THE LARGE FAMILY ROOM WITH ATTRACTIVE STONE FIREPLACE & HALF BATH IS IDEAL FOR ENTERTAINING! UPSTAIRS OFFERS A LARGE MASTER SUITE WITH 3 SKY-LIGHTS, LARGE WALK IN CLOSET & FULL BATHROOM. THERE ARE THREE OTHER AMPLE SIZED BEDROOMS & FULL BATH. THE LOWER LEVEL OFFERS A NEWLY FINISHED GAME ROOM WITH LOADS OF NATURAL LIGHT. TWO ADDITIONAL FINISHED ROOMS ON THE LOWER LEVEL THAT CAN BE USED AS A BEDROOM, OFFICE, DEN, ETC. GREAT OUTDOOR SPACE WITH A LARGE PRIVATE DECK OFF THE FAMILY ROOM, CONCRETE PATIO ADJACENT TO THE GAME ROOM WHICH INCLUDES A HOT TUB. CONVENIENT 3RD STORAGE GARAGE IS LOCATED AROUND BACK UNDER THE TWO CAR ATTACHED GARAGE. IF YOU ARE LOOKING FOR A HOME IN A GREAT LOCATION & A TON OF SPACE, LOOK NO FURTHER! Hello, I'm interested in 288 High Sierra Circle.